Featuring clean straight lines, this outdoor shade structure is the perfect complement to modern architecture. Its high-density fire-rated abrasion-resistant polyethylene fabric with UV stabilizers delivers remarkably effective and long-lasting canopy shade protection. The strong knitting pattern ensures material will not pull apart or unravel if cut or damaged. Canopy withstands winds up to 76 mph, and the powder-coated steel tube frame up to 145 mph. Canopy and frame are both available in a variety of colors to suit nearly any environment. The most highly insulating, diffuse-light-transmitting system for enclosing pools is also the ultimate in energy efficiency with insulation values as high as R-20. Factory pre-finished, corrosion-free, pre-engineered aluminum box beams form a total composite building system with Kalwall® translucent sandwich panels. A screened retractable roof system allows for fresh air and an outdoor swimming experience without bugs, leaves or other debris. Sidewalls can consist of sliding glass doors or translucent Kalwall for privacy as well as brick, masonry or other materials. Manufactured in the United States to meet or exceed all local building codes. Natural Structures water slide model 1663 optimizes a small space with a single, round tower post, spiral stairs with integrated landing and polyethylene flume. Customize and utilize your pool's limited spaces, walls, ceiling suspensions, rivers, lakes, beaches, indoor or outdoor facilities and recreation areas by adding a Natural Structures pool or water slide today. This recycled plastic bench and coordinating receptacle are new for 2010 and ideal for those locations looking for green products. They are made of the attractive and durable PolyTuf Plastic Lumber Product. PolyTuf is manufactured using 100 percent recycled milk jugs (post-consumer high density polyethylene). This set is shown in walnut plastic with deep red finish. 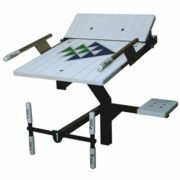 Gerber Manufacturing offers this popular, maintenance-free, 2 3/8-inch od welded steel "Monster" picnic table frame with recycled plastic top and seats. The frame is hot-dipped galvanized after fabrication for maximum protection. Stainless steel hardware is provided at no extra cost. Plastic is available in gray, redwood, tan and green. Order by Dec. 1, 2010 to receive special pricing. 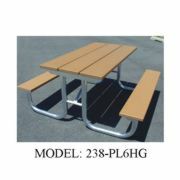 Gerber Manufacturing offers a complete line of picnic tables, park benches, grills and bike racks. SportMaster has been supplying owners with premium-quality sport surfacing products for over a quarter century. The company's dedication to bringing science and advanced technology to sports surfaces has resulted in systems of surfacing products that provide sport-specific optimum performance for both players and surface. SportMaster features 100 percent acrylic resins to ensure long-term protection from all the elements and supreme resistance to the sun's damaging ultraviolet degradation. Make your recreation/club facility the premier center for health and relaxation by adding year-round swimming to your program. Swimming has long been associated with outstanding exercise and therapeutic benefits. Be the facility of choice with a year-round enclosed pool for your aquatic programs. Swimming pools/spas provide vigorous workouts or relaxing moments, as well as the opportunity to add programs for seniors, children and swim teams. ATRIA Aquatic Enclosures include color-coated aluminum frames and rafters to minimize maintenance. Light-transmitting insulated roof panels open to allow for natural ventilation. In 2009, two major competitive swimming ruling bodies modified their rules to allow the use of an adjustable setting back plate in competitions under their sanctioning. This provides an additional surface for the swimmer to push off and provides a better transfer of energy from the swimmer's rear leg, resulting in stronger take-offs. Paragon Aquatics Track Start Plus+ offers upgrade kits that easily retrofit to and enhance your existing Track Start platforms with an adjustable back plate and hand grips. The slide assembly and locking pin make it easy to remove or reset the back plate, even during a race.